That you were validly married. This is usually done by providing the court with your marriage certificate, or a translation of a marriage certificate that is in another language. That the court has jurisdiction to grant the divorce. This is usually established by demonstrating that the parties are Australian citizens or, if not, that they are either a resident of Australia, have lived in Australia for at least 12 months, or that they consider Australia to be their home. That the marriage has irretrievably broken down. This is established by demonstrating that the parties have been separated for a period of at least twelve months. If you and your spouse tried to reconcile for a period of up to three months and then separated again, you need to extend the twelve month period by the amount of time in which you reconciled. If you reconciled for more than three months it is necessary to start the twelve month period of separation again. 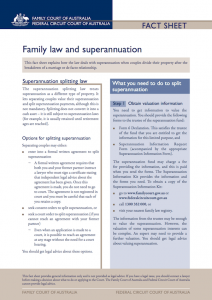 You can be separated and still living under the one roof, however you’ll need an affidavit verifying that you are separated whilst still living together. That the other person knows about the Application for Divorce. You do this by serving your spouse with a copy of the Application at least 28 days before the date of the Divorce Hearing. That proper arrangements have been made for any children of the relationship. 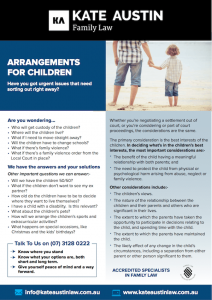 Part of the Application for Divorce asks questions in relation to the children, so this requirement is usually covered when you complete your Application. If there are no children under the age of 18, you don’t have to attend court for the hearing. 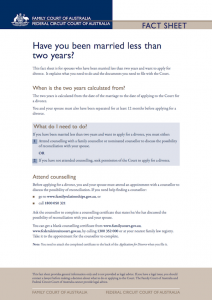 Also, if you are making the application jointly with your former spouse, you don’t have to attend court either. Yes. 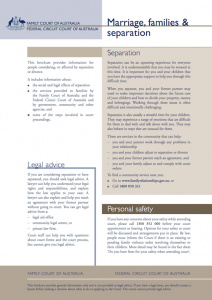 The Federal Magistrates Court website www.fmc.gov.au has a ‘’Do it yourself Divorce Kit” which you can download. Provided you follow all the steps and complete all the documentation correctly, there is no reason why you can’t obtain your own Divorce, however some people find the procedural steps a bit confusing and simply want someone else to take care of it quickly and painlessly. If this sounds like you, we are happy to help. 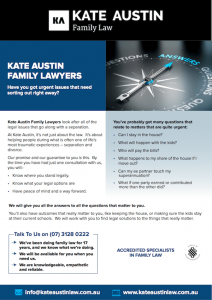 We can also provide you with a fixed fee to undertake your divorce from start to finish. Sometimes whether or not the parties have separated is in dispute and more commonly, the date of separation can be an issue in dispute between the parties. It is a good idea to communicate a separation in writing, even if it’s just an email or text message, so that the date of separation can be readily proven. 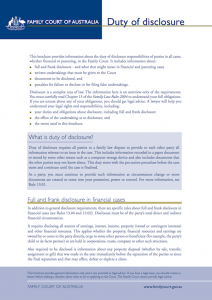 Often cases for property settlement in de facto relationships can turn upon whether a party can establish that separation occurred on a particular date. 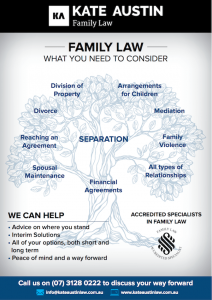 If a de facto relationship was less than two years long, the Court may have no jurisdiction under the Family Law Act to even hear and determine a property settlement, so establishing the date of separation can be very important. In the case of a divorce, if you cannot prove you separated from your spouse at least twelve months prior to filing an Application for Divorce, the Court will not grant a divorce for you. Whether or not the parties separated their financial affairs following separation. Whether the parties performed domestic duties for each other after the date of separation. Whether the parties slept in separate rooms or were intimate after the date of separation. Whether a party lodged documents with Government departments evidencing a separation, ie: Centrelink or the Australian Taxation Office. Whether or not it was publicly known that the parties had separated, ie: whether their friends and family understood that a separation had taken place. 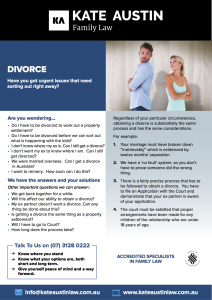 If establishing separation is potentially going to be an issue, an affidavit putting relevant matters before the court will be necessary and in some instances, having a solicitor prepare this document for you might be the most effective way to achieve your objective of obtaining a Divorce order.